This fall, I tried wrinkled crinkled cress for the first time. It blew my socks off! I am a lover of all kinds of greens, but currently this little cold-hardy cress with the cheerful name is my all-time favourite. At this year’s Eastern Canadian Organic Seed Growers’ Network (ECOSGN) Conference in Montreal Nov 9-11, I had the good fortune to meet Frank Morton, who developed this fantastic little plant. Frank, a commercial greens and seed grower in Oregon, saw it in his garden, thought it had potential, and saved it for seed. According to Frank, who gave the keynote speech, “the process of seed adaptation is based on the plasticity of plant genomes. Innovation and crop improvement is an inter-species interaction between crops and observant people.” Frank is a very observant person. The key to being a good seedsman, he says, is to know the crop really well by interacting with it all the time. Through seeding, weeding, harvesting and selling it. Frank now selects and breeds lettuce varieties, but only after years of selling salad mixes commercially. He emphasized the “need to be a samurai of the plant and the location” so that you can distinguish between the traits inherent to the plant and traits inherent to environmental factors. He believes that farmers have the potential to be excellent plant breeders because they are the samurais of the plants. Many of the speakers at the conference went beyond ‘seed saving’ to seed selection and breeding. Selection is important if you want to choose certain traits in a plant population. For example, Frank saw some purple splotches on a lettuce he was growing, and saved the seed from that plant. Eventually he had purple lettuce! Selection is really fun when there is enough diversity within a population (or enough mutations) that we can help to nurture a new variety with traits that are useful or pleasing to us. We can select for many traits, such as disease resistance, colour, yield, or taste. Breeding, according to Frank, is “accelerated adaptation of seed to your system.” It is a more deliberate process than just ‘saving’, where plants with specific traits are crossed, and then selected. In his in-depth workshop, he reviewed different methods of breeding. He reminded me of progeny row selection, a method I learned in 2002 from John Navazio. It is a very exciting ‘shortcut’ Navazio developed to speed up the breeding process and easy enough for amateur breeders to get good results fast (10 years or so). I will definitely be using this method for my own breeding projects. I can tell that Frank is the sort of person who likes to push on the edges of what is possible. He thinks we should be selecting for plants that are adapted to certain soil microbiological conditions. He also thinks we should be breeding plants with better roots by selecting for number and length of root hairs. He has discovered how to do selection for leaf colour and root characteristics at the seedling stage. This is another shortcut because the seedlings with the most potential can be selected after only a few days, rather than waiting until they are mature. He is also excited about selecting for plants that provide their own protection against pests and diseases. Finally, he very strongly advocated for farmer-based plant breeding. If breeding is in the hands of farmers, rather than chemical companies, agriculture as a whole would be much better. 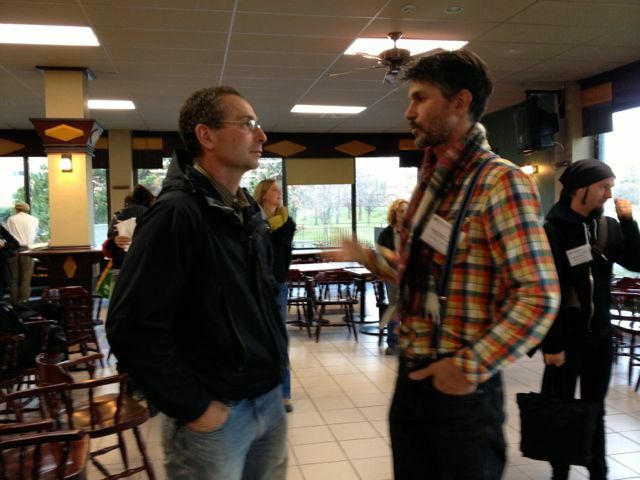 I also took part in a workshop given by Loic Dewavrin, of Ferme Longpré. I originally met Loic years ago at an ACORN conference. He grows organic grain with his brothers and son in Quebec. 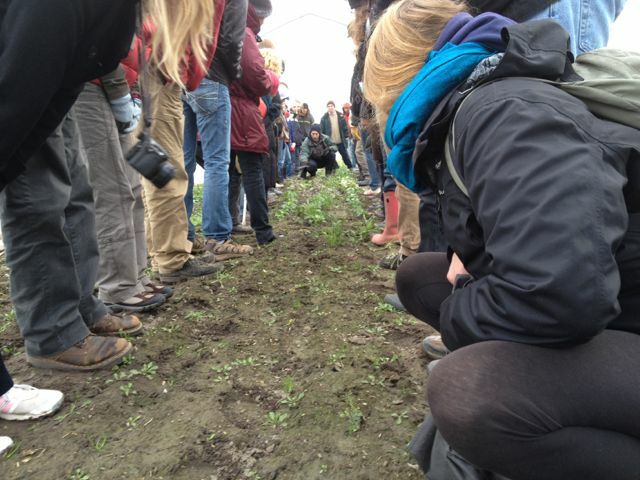 The first thing he emphasized is how important it is to build the soil. They grow and save their own seed, and the money they save helps to pay for seed cleaning and grading equipment. They have organized a farmer co-op to grow and select open pollinated corn seed. They have been doing this participatory farmer-based breeding work for over 10 years. I asked Loic about wheat selection and disease. His answer was really fascinating. A typical fungal wheat disease in Eastern Canada is fusarium. He said that they tend not to get this disease on their farm because (a) they have a balanced soil; and (b) they don’t use herbicides. Round-up, a herbicide made by Monsanto, tends to weaken plants, making them more susceptible to fusarium, he explained. The conference was definitely an eye-opener for me. I am impressed with the dynamic nature of seeds – how they can change in unpredictable and often helpful ways. According to Rowan White, an Iroquois woman who works for Sierra Seeds and who gave a closing address, “Seeds are dynamic, people are dynamic, and the earth is dynamic. We can’t keep it static.” That is a good thing. 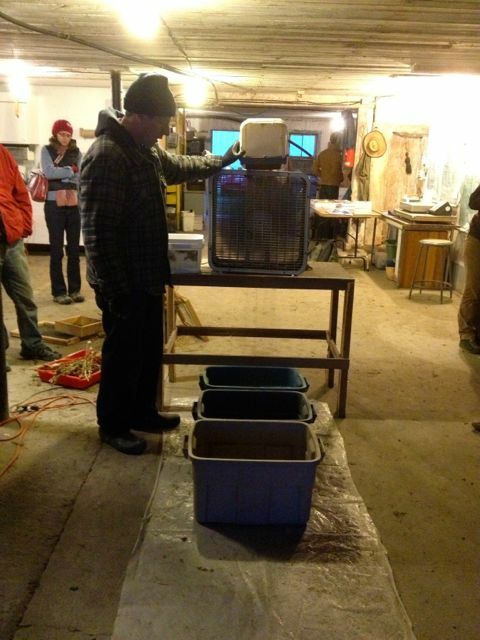 Above: Dan Brisebois, one of the conference organizers, showing his two-fan-with-square-bucket method of seed separation. Very simple and effective, but not expensive. 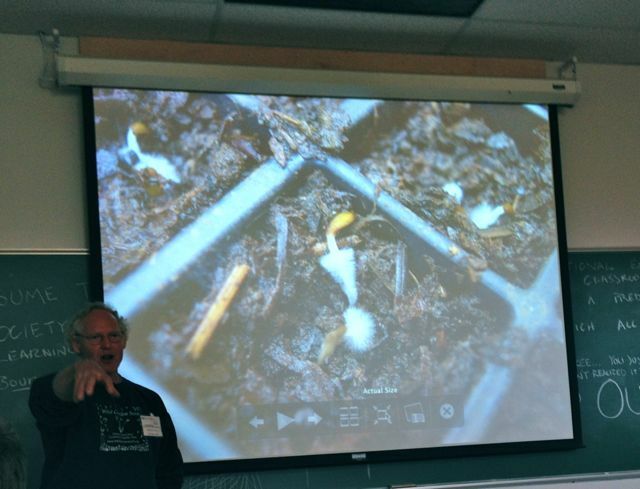 Above: Frank Morton of Wild Garden Seeds showing how we could be selecting seeds for root characteristics. 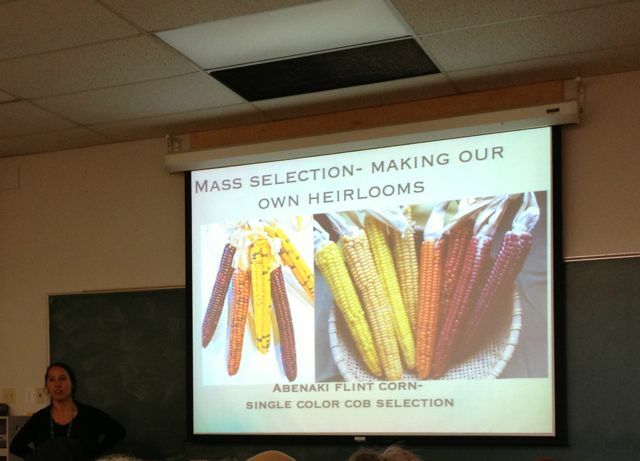 Above: Rowan White of Sierra Seeds Co-operative showing how corn cobs can be selected for all one colour from multicoloured cobs using mass selection. Above: David Greenberg talking with Patrice Fortier of La Société des Plantes about getting some furry-leaved potatoes that Colorado Potato Beetles don’t like. 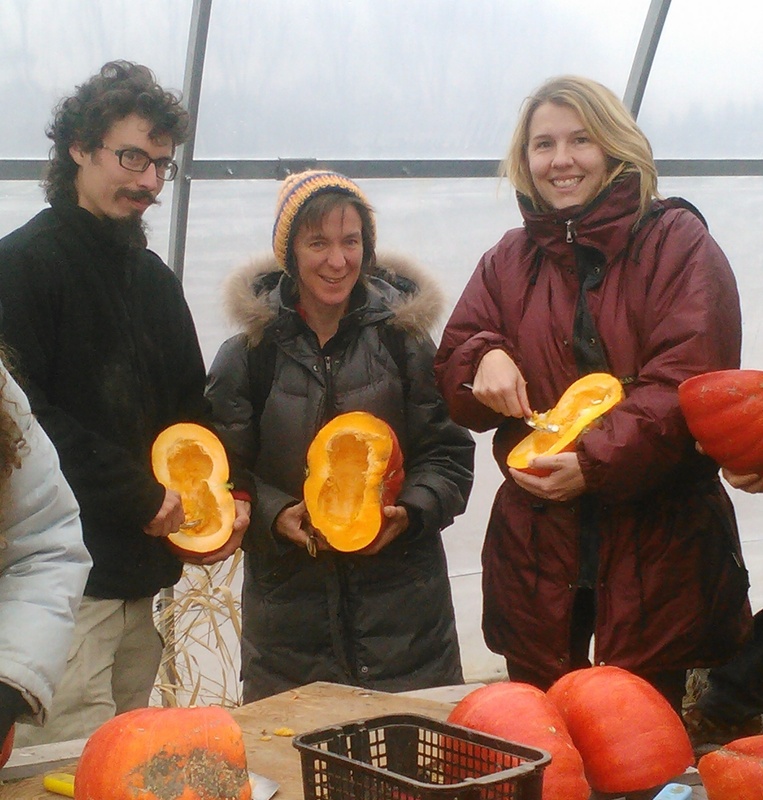 Above: Jen with two Québec seed savers scooping out squash seeds on Dan Brisebois farm Tourne Sol. This entry was posted in seed saving and tagged ECOSGN, seed breeding, seed selection. Bookmark the permalink.